Veronica Rodericks is a senior law clerk in our Aviation, Cargo Transportation and Logistics, and Professional Liability practices. 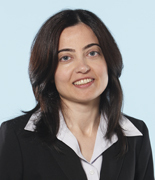 She has been working with Paterson, MacDougall LLP since October 2002. While working in Pakistan, Veronica worked for a major airline as an Executive Assistant to the Managing Director. Veronica has been a member of the Institute of Law Clerks of Ontario since 2005. She also holds a Beautician’s Diploma and a Diploma in Multimedia.